We have so many great wedding venues in our area, but no one venue is perfect for every couple. When you find your perfect venue, though, you’ll know. 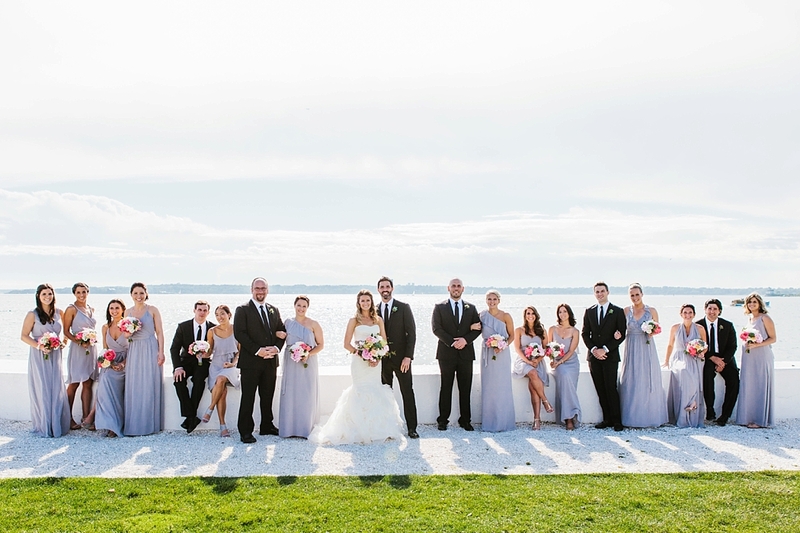 If a venue with plenty of indoor and outdoor space, great views, and wonderful photography options with a beachfront location sounds like your perfect wedding venue, I would definitely suggest considering Belle Mer in Newport. There really is so much to love about this venue. With 7-acres of beautifully manicured lawns, Belle Mer is the perfect setting for a large wedding. Yet, the venue also works well for small, intimate wedding parties. Whether you have 40 people attending your wedding or you have nearly 1,000 guests coming, great ocean views with the gorgeous Newport Bridge in the background, as well as other wonderful photos, can be a part of your wedding photography album. Belle Mer has four event spaces. One of the great things about these spaces is that each one provides its own wonderful benefits and unique photo opportunities. Plus, with both indoor and outdoor options, you don’t have to worry about the weather putting a damper on your wedding day. The Ocean Lawn provides some of the most beautiful photography opportunities. An oceanfront ceremony allows you to exchange your vows in front of a gorgeous flower arch or your own chosen decor with the ocean in the background. The waves lapping against the shore will provide soothing background noise while also providing a breathtaking background for your wedding photos. If you are having an evening reception, you may also want to take advantage of one of the venue’s giant fire pits. As the sun goes down, photos next to the fire pits are stunning. Along with the great photo opportunities, this option also allows for the largest number of guests, 1,000 people. This space is ideal for couples wanting a large indoor ceremony or reception. It is also a great backup plan if the weather isn’t cooperating. With floor to ceiling windows, you can still see the gorgeous ocean from the Water Salon. The ocean’s beauty can even be captured in your wedding photographs. This event space option also provides two really stunning fireplaces, which are wonderful wedding photography backdrops. The amazing chandeliers also look so great in wedding photos. Plus, when the weather permits, you have access to the lawn, giving your guests great indoor and outdoor space. If you want a slightly smaller space, Island House is another beautiful indoor venue option. From Island House, your guests can also enjoy great views of the ocean, and your wedding photos can reflect the space’s indoor beauty combined with the ocean views in the background. Plus, this venue option has really beautiful columns, which will look great in your wedding photos. Like Water Salon, Island House has easy access to the venue’s outdoor space, giving couples the opportunity for great indoor and outdoor photos. Located on the second floor of Island House, the Loft can be used for a small cocktail party or other small wedding celebration, but it is more often used as a bridal suite. The open layout gives the bride and her bridal party lots of room to get ready without getting in each other’s way. The gorgeous chandeliers and great views of the ocean provide great backdrops for pre-wedding photos. On a clear day, the blue sky and fluffy white clouds are a wonderful backdrop for your photos from the Loft. No matter which event space or spaces you decide to use, there are a few wedding photos you will not want to skip. Even if you choose to hold your wedding ceremony and reception inside, step outside for at least a few photos. Sunset photos, especially those near the water, are something I am sure you’ll love forever. With gorgeous crushed oyster shell paths, a beautiful lawn, colorful trees and flowers, and ivy throughout the grounds, there really are so many great photo backdrops at Belle Mer. Because of the venue’s expansive beauty and the opportunity for personalization, even if a friend or family member got married there, your wedding photography will still be unique and beautiful. Ultimately, no matter where you decide to get married, enjoy the experience, both of planning your wedding and of getting married. One of the keys to enjoying the whole process is having people on your side that you can trust. If you are looking for a wedding photographer, take a look at these photos that I took for a Belle Mer wedding. You can get a feel for my style and decide if I would be a good fit.